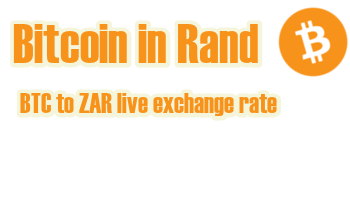 Convert Bitcoin (BTC) to South African Rand (ZAR): 53,158.59 ZAR | Live Bitcoin Price in South African Rands. BTC to ZAR live updated exchange rate at livebtcprice.com. Bitcoin price in South African Currency: "Rand" (ZAR). BTC to ZAR chart (intraday, monthly, 1,3,5 years).